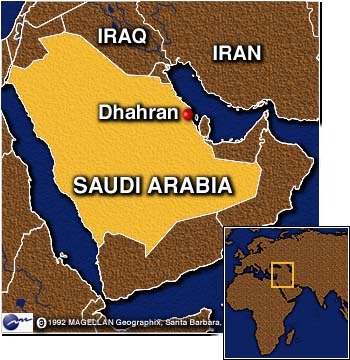 (CNN) -- The FBI wants to question a Saudi citizen, who is in custody in Canada, about the deadly bombing last June of a U.S. military base in Dhahran, Saudi Arabia. Hani Abdel Rahim Hussein Al-Sayegh, 28, was arrested Tuesday in Ottawa on suspicion of engaging in terrorism and being a threat to Canadian security, the Toronto Sun reported Saturday, quoting government officials. Sayegh is the second Saudi arrested in Canada for alleged links to the blast. Last December, Fahad Shehri, 21, was arrested in Ottawa after reportedly telling authorities he belonged to a group connected to the bombing. Details of the case against Sayegh will be kept confidential until a federal judge has reviewed them. The blast killed 19 servicemen and injured 500 Americans and Saudis at the Khobar Towers military complex. The FBI praised Canada for arresting Sayegh, and it credited Saudi Arabia with providing information that helped authorities find him. 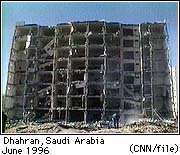 Earlier this year, FBI Director Louis Freeh and U.S. Attorney General Janet Reno complained about the lack of Saudi cooperation in its investigation of the bombing. A hearing is scheduled for Wednesday to determine whether Shehri should be allowed to enter Canada. He has asked for asylum, saying he fears for his life if he is sent back to Saudi Arabia.